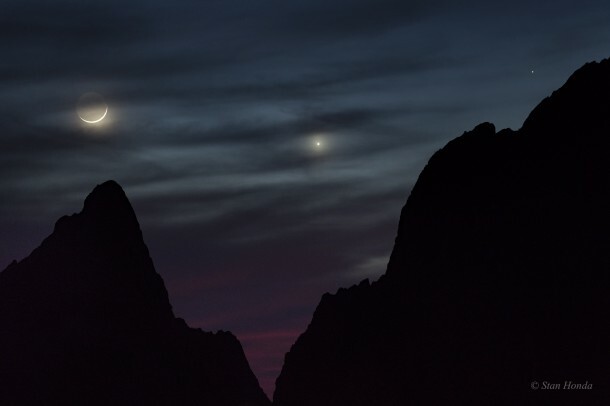 A slender crescent Moon and inner planets Venus and Mercury never wander far from the Sun in planet Earth’s skies. In the fading evening twilight of March 18, they line up near the western horizon in this atmospheric skyscape. While the celestial scene was enjoyed around the world, this photo captures the trio, with fainter Mercury at the far right, above the crags of Big Bend National Park in southwest Texas. Tonight the Moon will be full though, and rise opposite the Sun. Look for it high in the sky at midnight, near bright star Spica.